“If everyone goes for the job then who would do the business? Indian youth must study agriculture, apply the knowledge on the field to escalate the farm production and provide the technology share to other farmers to help them progress as well. Soon the time will come when consumer would be looking out for a family farmer to get the regular access of nutrition rich food, so become a farmer today, gain expertise and have a bright future,” are the words of Mrs. Swati Shingade, once police sub-inspector but now proud farmer and founder, Prapti Flora and Shingade Farms. She resides in Pune, Maharashtra while her farms are located at Baramati district, 100 km from Pune. Prapti Flora is engaged in growing and selling flowers namely carnations, chrysanthemum, rose and gerbera. Flowers are cultivated in 10 polyhouses (10 gunta each) developed on 2.5 acres. Later Mrs. Shingade diversified into dairy and organic farming with Shingade Farms that spreads in 55 acres. Sugarcane is the main crop cultivated while other crops grown are seasonal vegetables, wheat, Bengal gram, pigeon pea, groundnut, moong, chickpea etc. The farm produces are processed through women self-help groups and sold under the brand name ‘Salubris Pure Organic’ in Pune city. Mrs. Shingade completed M. Sc. in Agriculture and got selected in state level Maharashtra PSC Exam, 2007. She worked as police sub-inspector for six months but then left the secured government job to become a farmer. Today she has not only created a fortune for herself but also plays a significant role in transforming lives of many other farmers. 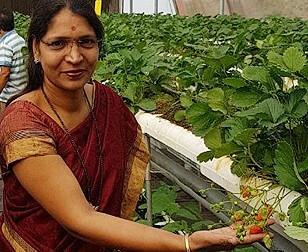 In the span of 10 years, her farmland ownership has increased from 7 acres to 55 acres, she had trained 1000+ farmers in floriculture, created floriculture and horticulture (organic) farmers’ groups to provide them guidance on production and marketing, diversified to desi breed dairy and organic farming with an aim to feed the growing population, and soon to launch agri retail stores to sell more than 100 organic products produced at her farm as well as 100+ associate farmers’ farmlands. All these professional achievements of Mrs. Shingade proves agriculture is a profession that has the power to proffer name and fame in life. She started her journey as a farmer with Prapti Flora in 2008. She chose her ancestral 7-acre barren land to begin her farming venture. Her first road block was bank loan. “To set up the polyhouse on 10 gunta (1 gunta = 120.999 square yard) I required loan of Rs. 10 lakh. I approached Baramati branch bank for the loan against the collateral of my ancestral land. They didn’t agree to give me the loan inspite of being an educated farmer! I contacted regional branch and told them that it is unfair to suppress the farmers in our country. If this continues how a farmer will come up in life? Finally, the loan was sanctioned and I became the first farmer to return entire loan amount within 15 months from the income generated through my very first project in just 10 gunta. Since then there is no looking back,” she shares. Seeing her success many farmers approached her for guidance. “It was more practical to train 25 farmers together hence we started the training center. We give the training on polyhouse cultivation as well as inform them about the market statistics. So far 1000+ farmers have been trained and are successfully running their floriculture units. Some of them have even expanded their floriculture units,” she informs. Farmers come from all over the country to receive training at Prapti Flora. Farmers are grouped together as per their region and flowers grown. If the farmer works sincerely then surely floriculture business is lucrative opines Mrs. Shingade. “It is ideal to begin with 10 gunta polyhouse that requires Rs. 17 lakh capital investment. ROI (return on investment) is attained in three years along with regular monthly income,” she explains. At Shingade Farms, primary crop cultivated is sugarcane while other seasonal crops grown are mix of vegetables, legumes, oilseeds and cereals. Post harvesting, all the farm produces are straightaway processed in-house through women self-help groups for example the pulses are prepared through hand-pounding method, jaggery is made from sugarcane, flours from millets and so on. Later these products are sold through direct sales under the brand name ‘Salubris Pure Organic’. Through this brand Mrs. Shingade sells farm products of other organic farmers as well who in her farmers’ group. “Similar to floriculture, we provide training and have made farmer groups for organic farming as well. To these group we also provide marketing assistance and have got their farms certified. As some of the farmers might fight it difficult to sell their farm products directly to end consumers we buy their produce and sell under this common brand name. We ensure to pay them at the deserved price,” she affirms. In order to reach more customers, soon two retail stores shall be launched. “So far 100+ products sold by us are produced by our farmer groups in Maharashtra but for few products such as spices that are not grown in our state we are trying to connect with organic farmers in Kerala and Goa. We aim to offer a good product range to our customers. Secondly I am more focused on A2 milk sales of desi cows because I need to keep the farmers in my network motivated to rear desi cows. If they are able to earn comparatively to A1 milk sales, then only they will continue to rear desi cows and so the organic farming movement shall be revolutionized,” she reveals her future plans.